The Hubby put a new cookbook into my Christmas stocking this year - the 'Best of Bridge' Slow Cooker Cookbook. Although this recipe is not from that book, him buying it for me reminded me that a) I have a slow cooker, and b) slow cooking is awesome. What I don't like is when you have to do a lot of pre-cooking before the slow cooking starts, which just makes me feel like there's no point in finishing things up in the slow cooker in the first place. What I do like is when you can just throw everything into the slow cooker and press Start. "Set it and forget it!!" I think people say. Or maybe that's referring to something else like alarm clocks or my recordings of Real Housewives on the PVR, or each and every single one of my New Years resolutions. Who knows, but in any event, slow cooking is super easy when all that you have to do is dump stuff into the thing and turn it on. This chili rice bowl is really tasty the first night that you eat it, and even better the next day reheated. 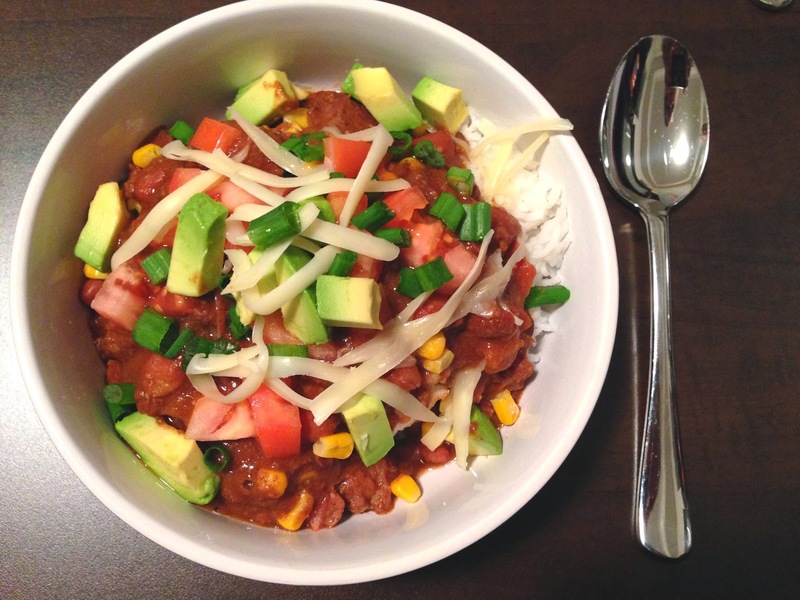 Mmm mmm mmm, I love the contrast of cold and hot when you add avocado and fresh tomato as a topping to the warm chili and rice. A crockpot meal is the perfect thing to come home to on a cold and rainy winter weekday. Put the beef into the slow cooker, and sprinkle with chill powder, salt, and pepper. Mix together the tomato paste and coffee in a small bowl, and add to the slow cooker. Add the pinto beans, including the liquid in the can. Add the bell pepper and the tortilla chips. Put the lid on the slow cooker, and cook on low heat for 8 hours. Add the frozen corn to the chili 10 minutes before serving. Serve the chili atop the cooked rice with toppings of your choice. I love my slow cooker and this looks like a great recipe! Thanks for sharing, +MeganMcLeod I hope you update your blog more frequently, I love all the delicious and healthy recipes you share here. Have a terrific day! Thank you so much! If you like slow cooker recipes, definitely give this one a try. Updating the blog is the hard part...if I had more time I would do it every day! Thanks for popping by...hope to see you back again! Delish! Awesome recipe once again! I loved it, the husband loved it- he had thirds!